A good news for users from UK territory. License key for Uniblue DriverScanner is now free. For all users from outside UK territory can use a proxy to get Uniblue DriverScanner with serial license key for free. Official price full license key for Uniblue DriverScanner is $39.95 but now $0.00 only. 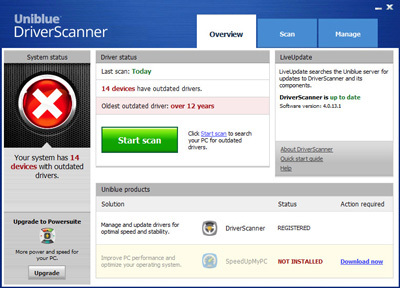 Uniblue Driver Scanner, the powerful tool to detect and update device drivers automatically. Just requires a few easy click to update all computer drivers in your PC. Uniblue DriverScanner has fully compatible the latest version Windows OS. It works on 32-bit and 64-bit platform. Please note, the exclusive promo is for users from UK only. If you are interested to download the tool use the following link. New Uniblue DriverScanner Giveaway Page: Visit the giveaway link! For outside UK users may need a proxy server or VPN to access the giveaway page. Its exclusive promo offer from Uniblue. You can get the serial license key by following the steps below. Download latest version installer Uniblue DriverScanner from its official website. Visit the giveaway page above and fill up the online the form. And then click next to confirm it. You’ll will receive a genuine license key or serial number for Uniblue DriverScanner on your email. Use the key to activate the software. Small Trick: For non-UK users, change the country to “United Kingdom” on the billing detail. If not, your order with $0.00 will be rejected. The promo Uniblue DriverScanner for $0.00 is available for a short time only. You must hurry to download before the offer expires. Gostava deste programa porque já tive um que sempre funcionou bem (I liked this program because I've had one that has always worked well).